The little over five hours it takes in the air are a long medium-haul flight, and it is surprising that most of the four carriers flying the route (Qantas, Virgin Australia, Jetstar and Tigerair) are operating narrow-body aircraft. 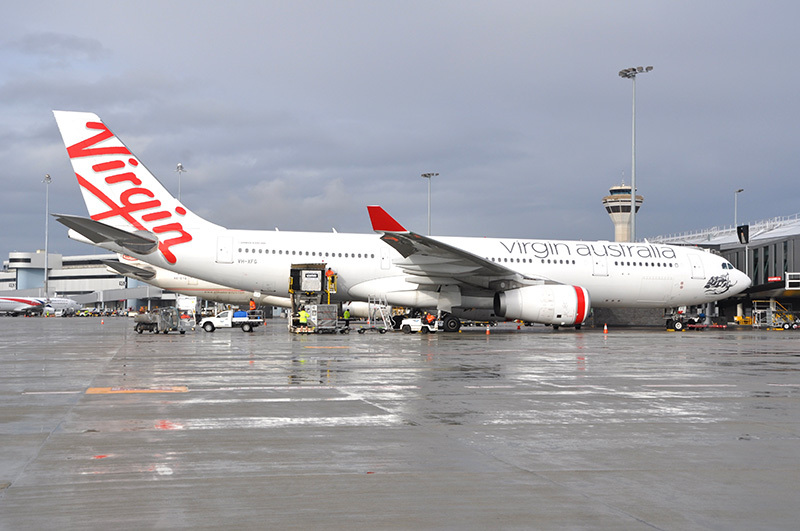 Virgin Australia is the second-biggest airline in the country and at the same time the biggest among the Virgin-branded ones. It is mostly a domestic airline which shows in its fleet mix of over 80 Boeing 737s, but just five Boeing 777s and six Airbus A330s. To get from Sydney to Perth on Virgin Australia while enjoying long-haul comfort, there are just two daily flights on A330s among many 737-operated services. I opt for the evening flight leaving Sydney at 7pm. And I am able to secure seat 2A online. Arriving at Sydney’s Kingsford Smith Airport I’m in for the first surprise: I am asked to exit the departure hall and go outside again to use a separate entrance called “Lounge Premium Entry” as it is brightly marked. Here there is a separate check-in and baggage counter, and most importantly, a separate security checkpoint. That’s what one would wish for in Europe, where it just exists in super exclusive First Class terminals or in to-pay-for VIP lounges like in Frankfurt and Munich. Travelling only with a cabin bag I pass security quickly and get into the huge, recently renovated lounge. After I just felt an air of exclusivity it is pretty tight and crowded inside. On the main floor waiting passengers sit tightly next to each other and the neon lighting and the buffet exude the air of a cafeteria. At least there is a wide selection of wines (self-service) and beer/cider (at the bar), no spirits however, and also a fairly wide array of food (fresh salads, soups, pizza). It’s easy to stuff yourself here, but the offerings are lacking a certain sophistication, it rather appears like a canteen. I discover there is another lounge area one floor up, here it is much quieter, but annoyingly the dire lack of power outlets to plug-in gadgets is the same, a real minus. Straight from the lounge the departure area is reached easily, but it’s a longer march to the gate. Four-year-old A330 VH-XFJ awaits departure, its cabin illuminated in impressive purple lighting while its dark outside. 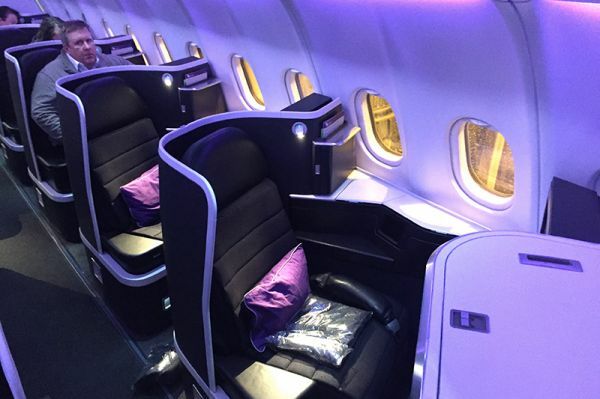 The cabin called “The Business”, introduced in 2015, offers 20 seats in five rows, based on the Super Diamond design by B/E Aerospace, used also by Qatar Airways, but very much customized here for Virgin Australia. 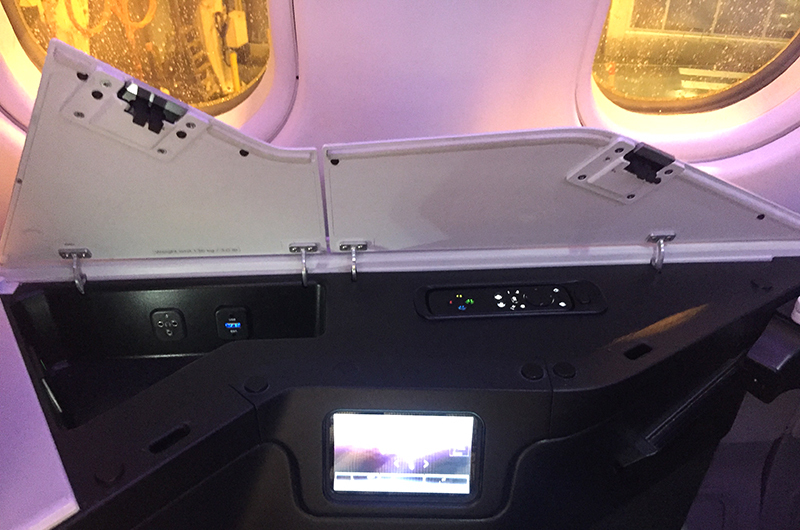 The seats with their curving walls made of black carbon fibre are installed in a 1-2-1 layout, with all window seats pointing outwards, while the middle seats point to each other. In the middle blue plexi-glass doors function as part of the dividers, which can be opened or closed. Striking are the many stowage options, including an enclosed one for tablets, around the seats which are 21’’ wide (53cm) –and by lowering the armrest another 7’’ can be gained. Even in a fully upright position the seatbacks are comfortably slightly angled, and the seats can be extended to a fully flat bed measuring two metres, on overnight flights it will even be covered with a memory foam mattress. These A330s fly domestic routes from Sydney, Melbourne and Brisbane to Perth, as well as international regional routes like to Hong Kong and Fiji. I am allowed to pay the pilots a quick visit in the cockpit, and off we go on time. On my 16’’ HD screen I use mostly the interactive flight map and also listen to music via the superb, sound-absorbing headphones. The variety of content in the IFE is sufficient, but not overwhelming. 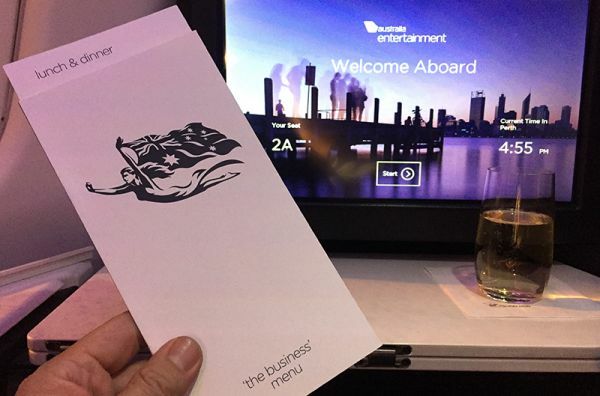 Contrary to its Boeing 737 fleet Virgin Australia so far doesn’t offer wifi on board the A330s, which is due to be retrofitted from early 2019. Interestingly there is an offering called “Airread”, where the University of Queensland delivers noteworthy articles, I read one about inner cities in France. This evening flight coincides neatly with meal time, already seven minutes after take-off the flight attendant in her bright red jacket brings a hot towel, after 15 minutes a water bottle and within 45 minutes aperitifs. I taste a Croser NV Adelaide Hills, Australian sparkling wine, no French champagne but absolutely drinkable. The wine list is fairly opulent with three reds, three whites and two desert wines (all but one New Zealand wine are local products), in addition there are three beers also from craft breweries and six spirits. The menus have been conceived by known Australian restaurateur Luke Mangan and Virgin Australia is known for the restaurant quality of its meals in Business Class. For starters there is a choice of poached chicken with couscous and goat’s feta or cauliflower soup with mint and parsley. For mains there are three options: Lamb moussaka with eggplant, steamed Barramundi with sweet potato curry and basmati rice or celery and apple salad with walnuts and cranberries. I opt for the soup, which is served one and a half hour into the flight, unfortunately not hot enough, but still tasting good. Unfortunately, my choice of wine, a Sauvignon Blanc, wasn’t loaded today. I taste three others which all fail to totally convince me and I stick to Chardonnay from the Barossa Valley. One hour and 45 minutes after rotation the main course arrives and looks appealingly colourful with the green curry and orange sweet potatoes, also tastes good. For desert I chose the cheese, which becomes another highlight, on the small plate there are two Australian and one English cheese. In Australia this is always served with quince paste, which also appears on the menu, but instead there is a little pack of fig and walnut paste on the plate, delightful, with crispy thin crackers and rounded off by a glass of Tawny from Barossa, the Australian version of Port. All in all a very satisfying meal. Afterwards I take a little nap, read and listen to music. We face an extreme head wind, it’s winter in Australia, and this leads to a delay of 15 minutes when we finally land in Perth after a flight of 5:25 hours. But this was easily coped with in this comfortable environment. Virgin Australia delivers a top product on the transcontinental route, on par with what the best airlines in the world offer on long haul flights, in cabin design as well as service and food standards. It’s here North Americans can learn something for their long domestic routes.